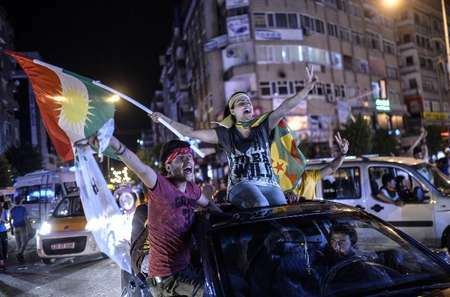 Turkey’s election results – good for Israel and the Kurds? Some good news emerged from Turkey last week after their parliamentary elections. 1. Elections results are in and Turkey’s ruling AKP Party lost it’s parliamentary majority. As it remains the country’s largest party, the question is what kind of governing coalition President Recep Tayyip Erdogan and Prime Minister Ahmet Davutoglu can cobble together. Opposition leaders say they’ll push for early elections if AKP is unable to form one. All of his potential partners – the nationalists, the Kurds and the Social Democrats – have criticized his hostile attitude toward Israel, believing that given the regional circumstances, Turkey should have joined forces with Israel to stand against their mutual enemy – Iran, according to the Israeli web site Ynet. The experts interviewed by Ynet agree that Erdogan will have to balance his policy toward Israel and stop his rantings against the Jewish state in order to take into account his partners. This could be even more pronounced if the foreign minister is a member of one of his future coalition partner or partners and not of his Islamist-rooted AKP . . . According to some analysts Erdogan may now be more concerned about his political survival than about fighting Israel – although this could have the opposite effect: as a result of his weakness, he could increase incitement against Israel in order to increase popular support for himself. As a preliminary to possibly increasing such anti-Israel incitement, an AKP leader blames the Jews and Crusaders for the AKP’s election loss. Turkey’s “Election 2015” overcame justified fears of major ballot-box fraud, which many thought would reinforce the ruling Islamists and pave the way for a worse-than-Putinesque totalitarian rule for President Recep Tayyip Erdogan. The election results themselves are best proof that any potential vote-rigging in favour of Erdogan was too little or too unsuccessful to become a game-changer: The ruling Justice and Development Party (AKP) needed at least 330 seats in parliament in order to rewrite the constitution in the way Erdogan wants; it got merely 258, not enough even to form a single-party government — leaving them in the minority in parliament for the first time since the AKP came to power in 2002. Ironically, the AKP objected to the Supreme Election Board’s vote recounts in two provinces and three towns — all too small to change the fact that Erdogan is the lonely sultan in his spacious, $615 million presidential palace. HDP: 81 (13%) “The pro-Kurdish Peoples’ Democratic Party”. This party was the indisputable winner of the election. It managed to pass the national threshold of 10% needed for parliamentary representation, by surprisingly winning 13% of the national vote. The Kurds, under one roof of a political party, are in the Turkish parliament for the first time in the country’s history. The HDP campaigned against the AKP and Erdogan, but in favour of the continuation of peace talks with Kurdish rebels. It advocates autonomy for Turkey’s overwhelmingly Kurdish southeast. Its charismatic leader has ruled out any constitutional change that would make Erdogan an executive president, or that would form a coalition government with the AKP. Bekdil then analyses the various options facing Erdogan for creating a coalition, or alternatively calling for early elections. The big question for us in Israel is will Erdogan’s election setback mean improved relations with Israel? The setback to Erdogan’s regime comes against the backdrop of the Turkish leader’s ongoing anti-Israel foreign policy stances and anti-Semitic rhetoric. “Particularly since the Gezi Park protests in 2013 [against Erdogan’s increasingly authoritarian rule], Erdogan and other leaders of the AKP have spent a lot of time railing against various foreign interests that they claim do not have Turkey’s best interest at heart,” Michael Koplow, program director of the Israel Institute think tank, told JNS.org. For example, during the recent election campaign, Erdogan lashed out at the foreign media for criticizing him—and floated an anti-Semitic conspiracy theory in the process. At a rally, he said that “Jewish capital” funds the New York Times and that the newspaper has consistently criticized Turkey’s leaders dating back to the days of the Ottoman Empire. While the recent elections results were a setback for Erdogan’s ambitions to seize more power, they are unlikely to change Erdogan’s behavior, according to Koplow. Efraim Inbar, a professor of political studies at Israel’s Bar-Ilan University and director of the Begin-Sadat Center for Strategic Studies (BESA), is not optimistic about AKP’s imminent political downfall and does not expect a change in Turkey’s attitude toward Western nations and Israel. Yet Dr. Harold Rhode—a distinguished senior fellow at the Gatestone Institute think tank and the former Turkish Desk Officer at the U.S. Department of Defense—is encouraged by the possibility that Turkey’s Republican People’s Party (CHP), which won 132 seats, as well as the Nationalist Movement Party (MHP) and the Kurdish Peoples’ Democratic Party (HDP), which gained about 80 seats apiece, may be considering forming a governing coalition that leaves out AKP. Other analysts, however, consider AKP’s absence from a coalition to be an unlikely scenario. The Syrian civil war was also a major factor in determining the outcome of the election. “The AKP’s Syria policy is deeply unpopular throughout Turkey, but especially with Kurds in southeastern Turkey,” Koplow said. Indeed, many Kurds were upset with the Turkish government’s response to the Islamic State terror group’s siege on the Syrian-Kurdish town of Kobani earlier this year. “I don’t see any signs that Turkey is going to shift their Syria policy,” said Koplow. According to Rhode, the election results have also caused a major transformation in Turkish society. Suddenly, all over Turkish social media, users are posting humiliating comments about AKP and Erdogan because the election results led them to lose “their fear of Erdogan that they would be arrested and thrown in jail,” Rhode said. “People are also talking on the phone in the most vitriolic way against Erdogan,” whereas beforehand they were afraid to do so, he said. In Turkish media, there is also a visible change. During the Erdogan era, Turkish newspapers have been frequently hit with huge tax-evasion lawsuits and have had to pay huge fees. To offset this cost, editors hired journalists who published pro-Erdogan content., Now those journalists are being fired. The media is essentially telling Erdogan to “go to hell,” Rhode said. Indeed, despite strained political relations, annual trade between Israel and Turkey stands at a robust $4 billion. Anything that reduces the power of the would-be Caliph Erdogan and his AKP party can only be a good thing for Israel and the west. This entry was posted in International relations, Israel news, Mideast news and tagged AKP, elections, Kurds, Recep Tayyip Erdogan, Turkey, Turkey-Israel relations. Bookmark the permalink. 4 Responses to Turkey’s election results – good for Israel and the Kurds? Yep. And we can learn from the Turks about raising the electoral threshold, which is what persuaded them to join forces in the first place. We need to do the same here.